Inch by inch, feather by feather, Rovio is turning Angry Birds into the bloody sword-fighting game it was always meant to be. The next step in the hit mobile gaming franchise's evolution from a cute physics-based puzzle game arrived today in the form of Angry Birds Epic, out now for Android, iOS, and Windows Phone-powered gadgets. When Rovio first announced that it was making an Angry Birds game modeled off old-school turn-based role-playing games like the early Final Fantasy, a lot of people were understandably...surprised. "What?" Kotaku's Mike Fahey asked after hearing the news, giving voice to many a RPG fan's skepticism. Even people who dutifully played and enjoyed almost every installment in the core line of bird-chucking puzzle games (such as myself) recoiled in terror when Rovio tried to spread its wings with the 2013 kart racing title Angry Birds Go! a game that looked cute but played horribly and hit you up for cash at every conceivable turn. Well, I summoned the courage to download Epic this morning. And I'm happy to report that it's nothing like Go! That is to say: it's actually a lot of fun so far. I only managed to play a few levels, mostly while I was waiting on line for a salad earlier today, but it reminds me a lot of a game like Bravely Default, that excellent JRPG that came out for the 3DS earlier this year. This is all the more impressive considering that it runs on smartphones and tablets rather than a dedicated mobile gaming console. I haven't been able to truly sink into Angry Birds Epic yet, so my main takeaway here is: yes, it's good, go play it. For a more thorough breakdown of its mechanics, check out Mike's early writeup. 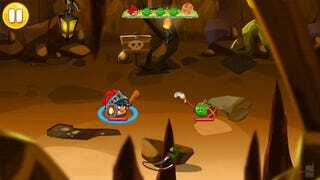 Download the game for free here.